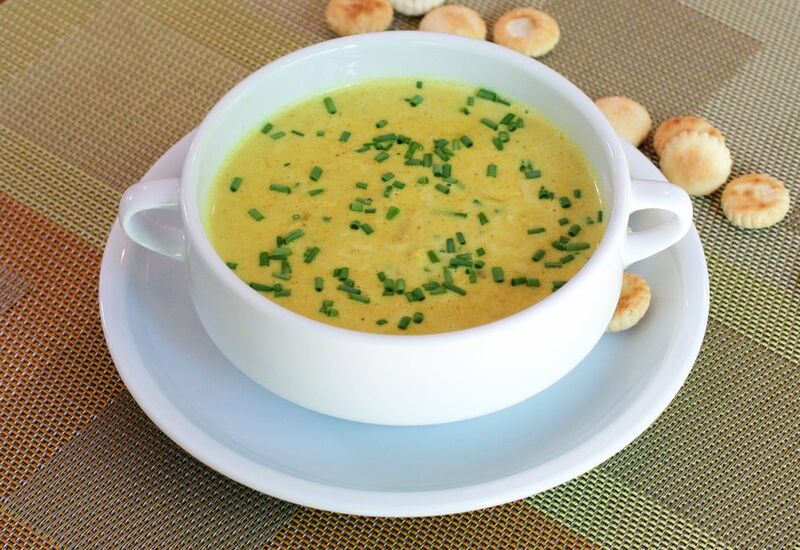 This creamy, curry-flavored soup is ridiculously easy to fix, and the flavors are fantastic. Condensed cream of chicken soup is gussied up with some cream, diced cooked chicken, and curry powder. Open a few cans and chop some chicken; that's all there is to it! Poach or bake the chicken up to a day in advance, or use a fully cooked rotisserie chicken from the deli. If you prefer all homemade ingredients, you can make your own cream soup substitute (see the tips). Or, use cream of mushroom soup and add some fresh sauteed mushrooms along with the chicken. An attractive garnish can make an ordinary soup stand out. Choose one of the suggested garnishes or add your own special signature to the soup. Combine the cream of chicken soup and chicken stock in a saucepan; whisk to blend. Add the heavy cream and stir to blend. Add the diced cooked chicken to the saucepan along with about half of the curry powder and stir to blend thoroughly. Taste and add more curry powder, if desired and add salt and pepper, as needed. Place the saucepan over medium heat and cook just until the soup comes to a boil, stirring frequently. Reduce the heat to low and simmer for 5 minutes. If desired, add lime juice and stir to blend. Garnish the creamy chicken soup with chopped fresh cilantro or green onion tops, or swirl a small amount of sour cream or Greek yogurt on the soup. Curry powder can be mild or hot. If you don't have curry powder in your pantry or if you prefer to make your own, combine these ingredients in a small bowl or cup: 1 tablespoon of ground cumin, 1 tablespoon of ground cardamom, 1 tablespoon ground coriander, 1 tablespoon of ground turmeric, 1 teaspoon of dry mustard, 1/4 teaspoon of ground ginger, and 1/2 teaspoon ground cayenne pepper, if desired. If you'd like to substitute a homemade cream soup, melt 6 tablespoons of butter a saucepan over medium heat: add 6 tablespoons of flour and cook for 2 minutes while stirring constantly. Add 1 cup of chicken stock and 1 cup of milk along with 1/2 teaspoon of garlic powder, 1/4 teaspoon of pepper, and salt, to taste. Cook until thickened, stirring frequently. Use in place of the two cans of condensed soup.